Central African Republic “On The Verge of Genocide”: The Shadow of Rwanda? Khadidha-Aladji-Abdou, pictured left, is only 30 years old, but looks much older, the horrors she has experienced branded not only in her face but in her soul. The picture is graphic, one of many; unfortunately it is accurate. The caption by her face reads “…[she] saw all of her three children and husband, his second wife and her four children shot dead and herself was shot in the head. She’s the only survivor of that incident. Khadidha-Aladji-Abdou was shot in the back of the neck and left for dead with several other members of her Perhl [ethnic] group.” The Perhl are a small Moslem ethnic group; in all Moslems, who tend to live in the more northern regions of the Central African Republic (C.A.R. ), near the Chad border, make up somewhere between 10-20% of the country’s predominantly Christian population. The horrors that led to the murders of her family, and very nearly took her own life, were probably a part of a revenge killing against Moslems carried out by Christian `anti-Balaka’ fighters. These fighters are mostly child soldiers, organized into unruly militias meant to spread retaliation among Muslims for the massive killings, torture, rapes and destruction carried out in the C.A.R. by Moslem`Seleka’ fighters. The Seleka,a somewhat unruly coalition of Muslim militias, were made up of mostly foreign mercenaries, 90% of whom were recruited from neighboring Chad and Sudan. It is the Seleka who initiated this latest round of bloodshed who invaded the country and were able to seize power and overthrow it sitting president, Francois Bozize who fled to Cameroon. Like the man who replaced him, Bozize came to power through a military coup in 2003.On overthrowing Bozize the Seleka (seleka means `coalition’ in the Sango language) installed their own man, Michel Djotodia, in the Central African presidency. Once in power, in a situation not unlike that in Libya, Djotodia found himself unable to control the militias he supposedly led. Although the Seleka was formally disbanded two months go, in September, 2013, these `ronin’ Seleka bands continue to pillage the countryside unchecked by the new government which is both helpless to stop them and seems to have little incentive to stop the violence. According to United Nations Deputy Secretary General Jan Eliassen “the C.A.R. is deteriorating before our very eyes,” and “on the verge of genocide.” Eliassen went on to relate that the entire population of some 4.6 million was “enduring suffering beyond imagination” with a full one-third of the population in dire need of food, healthcare, protection, water, sanitation and shelter. The danger of a Rwanda-like fiasco of violence has been noted. Sensitive to the fact that it is accused of complicity in the Rwanda genocide, accusations that have a great deal of merit, France is scrambling to avoid a similar stigma in the C.A.R. through preemptive international military action. In the short run, a French or United Nations Security Council condoned military intervention could temporarily help avoid the current disaster from spinning out of control. Of course omitted from France’s concern about the human rights tragedy unfolding in the Central African Republic is Paris’ history – uninterrupted over the past 125 years – of exploiting the country’s rich national resources and manipulating the country’s political system through the employment of France’s Africa holy quartet: intelligence, bribery, special forces intervention, control and manipulation of mercenary forces to undermine any political leader or movement that challenges French corporate interests. Indeed, France’s involvement in the C.A.R. is yet another fine example of how `liberty, equality and fraternity translates into `repression, glaring inequality and ethnic hatred’ in France’s former African colonies. Indeed, France’s involvement in the C.A.R. is yet another fine example of how `liberty, equality and fraternity translates into `repression, glaring inequality and ethnic hatred’ in France’s former African colonies. For the second time this year alone, France is intervening militarily in the country. French Defense Minister Jean-Yves Le Drian announced yesterday (November 27, 2013) that France will send 1000 French troops to the C.A.R. to join a contingent of 400 already in place in Bangui, the capitol. Those already in place are there to secure the airport and protect French citizens, not to resolve the ethnic crisis . 2500 African troops are already there unsuccessfully trying to help maintain order. France is trying to get support from the United Nations Security Council to send a peacekeeping contingent, but at time of this writing, no action has been taken. Apparently a contingent of U.S. Special Forces is also on the ground too there, but with a separate mission to help track down Joseph Kory of the Lord’s Resistance Army hiding out in the country’s northeastern region near the South Sudanese border. At least as it has been reported, these U.S. military units have not involved themselves in the C.A.R.’s internal tensions. If military intervention is temporarily possible to freeze the violence, France is equally concerned about protecting its vast economic interests in uranium, diamonds, gold rare timber and tobacco which makes the C.A.R. one of France’s most valuable African assets all of which France has extracted – if not downright looted – from the time the region came under French colonial control in the 1890s. Since the country’s 1960 independence, France has been much more a part of the problem the C.A.R. faces than a part of any solution. In fact, while nominally independent, the country has remained both economically and politically very much of an informal French Colony and an integral part of a system put in place by Charles De Gaulle at the end of the 1950s which is referred to as “Francafrique“. At World War 2’s end, De Gaulle, understood that France would be forced to give formal independence to its colonies in Africa and elsewhere. The pressures only continued over the next decade as the decolonization movement put him in an increasingly uncomfortable position when he returned to power in 1958. A supreme realist, he understood that he had to officially grant independence to France’s sub-Saharan colonies. This was demanded by the ethical standard of the times. At the same time, De Gaulle instructed his `right arm’, his `man in the shadows’ – Jacques Foccart, head of the Gaullist party, to finance underground, the secret services, to do exactly the opposite, that is to construct a system so that these countries remained dependent upon France economically and politically. The rules of the game were well-defined: on the one hand, the former colonies of Africa would gain their formal independence, but at the same time they would remain tied to France economically and politically more closely than ever. To do so was, of course, illegal, and thus to be achieved in a hidden, secret, underhanded manner. The essence of the plan: permit only those changes which help maintain the status quo. France did everything within its power to insure that independence was little more than an empty shell, the leaders of its former colonies transformed into well bribed agents of Paris. France’s relationship to the C.A.R. is a classic example of how the `Francafrique’ system works. What emerges is not a pretty picture, not at all. Underneath the glowing image of French-African friendship is a history of economic exploitation, seething `Latin American-like’ repression and a sea of corruption. If, once again, the C.A.R. is today on the verge of collapse, as in Rwanda, France, through its unbridled greed, unending economic corporate exploitation and profound political cynicism, bears no small amount of the responsibility for the unfolding tragedy there. Having in large measure created the socio-economic conditions, the underlying causes of Central African misery, now France sends in the troops in an effort of damage control. But sending a few thousand soldiers to freeze the political crisis, done in a manner to maximize France’s public image can hardly undo the damage of six decades of `Francafrique’. Added to this is France’s current aggressiveness in Africa and the Middle East. As the United States position in the Middle East and Africa weakens given the strategic shift towards Asia, France – be it in its more conservative or politically liberal form – has attempted to move in to fill in the partial vacuum, as Immanual Wallerstein notes. Having mastered its interventionist impulse behind a veil of humanitarian interventionism, it’s seems champing at the bit to send in the troops, bomb from the air. Its recent military role in Libya , Mali, Syria and now the Central African Republic. In Africa it has permanent troops in Chad, bases in Niger, a marine contingent in ships off the coast of the Gulf of Guinea as well as mercenaries and contract security firms (a fancy name for hired guns) in many of their former colonies. Not only has Paris followed a more militarized, aggressive role in Africa, but on another level, they hope to replace Great Britain as the U.S. junior security partner as well. In Africa, France has a sorry, oppressive record of defending tyrants, human rights thugs, cunning but otherwise vapid leaders – anyone who will defend their sizable corporate interests in the continent which only continue to grow. 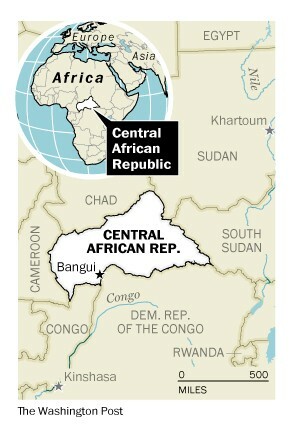 The C.A.R., resource rich, is one of the world’s poorest countries, a status it has suffered since independence. Per capita income is below $300 annually, that is people living on less than $1 a day. It is a classic example of what is referred to as `the resource curse,’ a country rich in mineral wealth the profits never reach its people. Despite important diamond and uranium deposits that make more than 60% of the its exports, infrastructure in communication, medical care, education hardly exists. It political leadership has consisted of a series of dictators, one worse than the next, up to the present. Virtually all of them either were literally installed by or cooperating closely with (run by) the French secret service (or French run mercenaries) whose main task is to insure that the country’s resources and wealth remain firmly in French hands. The people of the country might be suffering from abject poverty but for the past 125 years the C.A.R. has been nothing short of a cash cow for French corporate interests – the gift that keeps giving – and one that France still covets and will do whatever necessary to maintain control. It should be no surprise that corruption is rampant (encouraged by Paris to neutralize any thoughts of independent political leadership), the country an important center of drug trafficking, illicit channels of funding money to tax havens (true of all Francafrique), blood diamonds, etc. Any manifestation of social movements, democracy is crushed in the cradle through the extensive network of the country’s (once again French run) security apparatus. As in Rwanda, another country that suffered from all the same manifestations before the 1994 genocide, another tactic used to divide the C.A.R. population is the fanning of ethnic tensions, especially between the country’s more Moslem north and its Christian south. When it comes to fanning ethnic hatreds, it must be admitted that `nobody does it better’ than the French, who, starting with Algeria in 1830, have a long history of turning clan against clan, language group against language group, religion against religion in order to maintain political and economic control. In the C.A.R., the emerging gray eminence behinds the scenes, determining the price and commission of the country’s uranium exports is Areva, the French uranium giant. In classic neo-colonial style, France considers the uranium (and other mineral) deposits of its former colonies essentially its own.France will do whatever necessary to maintain control. Are the current “humanitarian concerns’ little more than a thin cover for saving Areva’s uranium concession there? While the most lucrative African uranium deposits are found in another former French colony whose political and economic life is dominated by Paris, Niger, those recently developed uranium deposits in the C.A.R. have taken on strategic importance. Uranium – specifically uranium-phosphate deposits – was discovered at Bakouma as early as 1947 but was not developed until decades later in 2005, 2006. These recently developed ore deposits are not particularly large quantity but contain a very high uranium content. So, what is the U S(Government) doing, in the disaster unfolding in C. A R ? After throwing away $ 6 trillion, or more, in foreign adventures in the Mideast, (Near East), over the last 10 years, has the U S got a belly full of adventures in foreign lands ? would the U S be in C. A. R. in a flash ? So, far, that seems to not be the case.